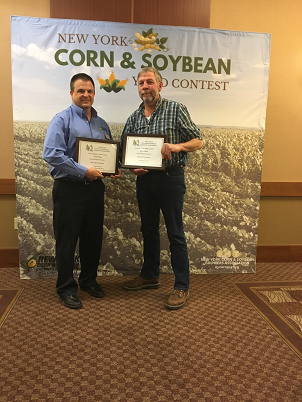 MINNETONKA, Minn., USA, March 20, 2018 – Dennis Forrester’s crops overcame much to deliver a victory in the New York Soybean Yield Contest, placing first in the North Regional Group 2 division with NK® Soybeans S20-T6 brand from Syngenta. Dennis Forrester and New York Corn and Soybean Growers Association President Jason Swede. In a year that delivered almost 50 inches of rain, the region around his Henderson, New York acres faced intense white mold pressure after a cold, wet start. Even so, Forrester’s soybeans thrived – producing an average 68.69 bushels per acre (bu/A). “Yields across the region were down, but S20-T6 brand stayed consistent. It’s a strong variety with good characteristics,” Forrester said. The industry standard for Sclerotinia white mold tolerance, S20-T6 brand is highly productive in a variety of soil types and also features strong Sudden Death Syndrome resistance. By pairing these qualities with close consideration of his local agronomic challenges, Forrester was able to seal his win despite heavy rainfall and a late harvest. He bested the U.S. Department of Agriculture’s reported 2017 state average for New York by almost 24 bu/A. NK Soybeans like S20-T6 brand offer a cutting-edge addition to growers’ seed portfolios, with unique and innovative varieties developed through the latest scientific advances. Featuring a choice of herbicide trait selections, they help growers spread risk and maximize potential returns. As a reward for his success, Forrester was awarded with special recognition and a plaque at the New York Corn and Soybean Association’s 2018 Winter Expo in Liverpool, New York. For more information, visit www.NKsoybeans.com. Join the conversation online – connect with us at Syngenta-us.com/social. ©2018 Syngenta, 11055 Wayzata Blvd., Minnetonka, MN 55305. NK® Soybean varieties are protected under granted or pending U.S. variety patents and other intellectual property rights, regardless of the trait(s) within the seed. The Genuity® Roundup Ready 2 Yield® and Roundup Ready 2 Xtend® traits may be protected under numerous United States patents. It is unlawful to save NK® Soybeans, Genuity® Roundup Ready 2 Yield® or Roundup Ready 2 Xtend® Soybeans for planting or transfer to others for use as a planting seed. Roundup Ready 2 Yield®, Roundup Ready 2 Xtend®, Genuity®, Genuity and Design and Genuity Icons are trademarks used under license from Monsanto Technology LLC. Unless otherwise expressly stated, all trademarks indicated as ®/TM/SM and the trade dress are the property of a Syngenta Group Company.